If you have ever tried to leave your house only to have your dog leaping at the opportunity to escape, then you may be wondering how to stop this behavior. You probably know that chasing your pup isn't the best solution ... but what should you do if your companion does sneak out? This common issue is better known as ‘door darting’ and it can make any pet parent feel discouraged, especially if you've got a repeat offender. Unfortunately, if your dog does successfully fly the coop, multiple safety issues can also arise. The good news is that Dr. Sarah offers effective tips for addressing this problem in this episode of Pet Talk. Her step-by-step guidance will also teach you some commands to use so you can safely keep your companion inside despite any tempting doors being opened. The great thing about cats is that they are superb at being independent and social companions. 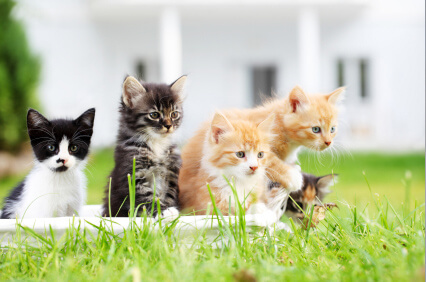 Most cats enjoy spending time outside playing with other felines. As a pet parent, it is very important that you are aware of some possible dangers associated with having your cat freely roaming outdoors. Since the 1960’s, Feline leukemia virus (FeLV) and feline immunodeficiency virus (FIV) have been spreading amongst the feline population worldwide. While these two diseases are preventable, they are contagious and potentially fatal if they are not detected early enough. The good news is that vaccines are available to decrease the chances that your feline will catch FeLV or FIV. We’re pleased to bring you news of another financial award given by our non-profit charity, this time to a small, inspirational group of rescuers headquartered in Ohio. A breed-specific rescue group, this organization places abandoned coonhounds with foster homes until appropriate adoptive families can be matched to these quintessentially American dogs. Aptly named, American Black & Tan Coonhound Rescue (ABTCR) is a not-for-profit association that’s been in continuous operation since May, 2004. In their many years of operation, ABTCR has helped to rescue and find forever homes for untold numbers of hounds, not just in Ohio but all over the country.